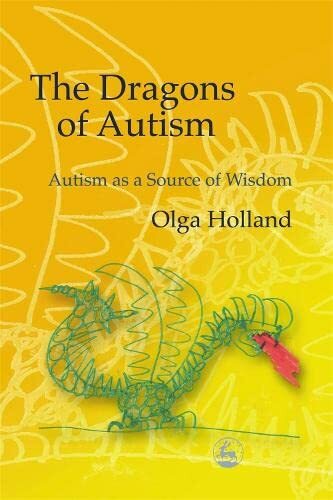 The title of this book is derived from the author's son's deep and enduring interest in dragons – the intense sort of interest that is a hallmark of autism. Billy loves dragons and understands much of his world through a framework of dragonlore. His mother takes advantage of that interest to help him overcome his limitations and obstacles. The book is an explication of the strategies she uses and the inspirations behind them. It is also the story of her developing relationship and understanding of her son. Anyone who has a child with autism will instantly empathize with this family's plight. Anyone who doesn't might want to read it to gain some insight. Holland describes the many strategies she has used to help her son deal with his challenges. These are not revolutionary strategies and for the most part they can be picked up in the educational or psychological literature. But one instinctively roots for this mom as she learns through trial and error what helps her son. All children with autism are unique individuals with different strengths and weaknesses, phobias and talents. What worked for Billy may or may not work for another child with autism, but what is important about this story is the theme of "try and try again" until something works. And because children with autism are so different, parents and caregivers must be willing to be creative and look outside conventional channels for ideas and support. This mother epitomizes that attitude. Some may criticize her strategies as being unavailable to those of average means – for instance she moves her family across the country from New York to San Diego because Billy benefits from living in a climate is which he has the opportunity to run around outside all year. Most people cannot accommodate their children's needs to quite that extent, but the fact that she realized what was important for him and found a way to address that need is the real lesson in the story. People looking for support in their own searches to help their children will find encouragement in this book. One refreshing aspect of this book is that it is not another fantastic story about how a parent "cured" her son's autism. At the end of the book Billy remains a child with autism who has made substantial progress but who continues to face daily challenges. No miracle cure or secret trick is touted. Parents and caregivers are not asked to suspend their disbelief or encouraged to chase a holy grail. This may be a relief to parents and others who are tired of reading about and chasing after pipe dreams. While there is much to be said in favor of this book, there is also one serious concern – the book misrepresents itself both in its title and advertising. Contrary to one statement on the back cover, clearly written by a publicist, at no point does the author claim to have found her son's autism to be a "blessing." She has done her best to address his problems and help him integrate with the rest of the world, but given the difficulties she and her family faced there is every indication that she would have preferred her son not be afflicted with this disorder. In the same way, the book's subtitle is overstated. I was never able to track down an instance in which Holland claimed that autism was a source of wisdom. Her son's autism certainly inspired many creative thoughts and she gained wisdom that helped her address his needs, but the implied promise of identifying some greater meaning in or through autism was never realized nor seriously attempted. This book is a decent chronicle about life with a child with autism. To help others gain insight or to find encouragement for your own struggle, it is worth a read. As a guide to interventions and strategies, it is hit-or-miss depending on how well a given child resembles the child in the book. And as a philosophical treatment of the "wisdom" found in autism, it is useless. Kristin Nelson, M.A., is an assistant professor and medical ethicist at Rush-Presbyterian-St. Luke's Medical Center & Rush University in Chicago. She is also the mother of four-year-old twins on the autism spectrum.